In the week where the Nashville mainstream made their presence felt in the UK and Ireland with the Country-to-Country Festival, it would be remiss not to give a few column inches to a release embedded in this scene. Therefore, amongst the deluge of Americana, folk and singer-songwriter submissions to peruse, an interesting new record from Scotty McCreery landed to make a case. To insert a slight addendum, this is an artist on the rebound from given the boot off a major label, so in essence there is a little tale of the outsider in the story if not wholly to the sound. SEASONS CHANGE is the comeback album from an artist previously launched to big ideals on the back of ‘talent’ TV success, and an attempt to replicate the achievement of a recent #1 single from an industry position where he needed to pedal a little faster. This album sits firmly in the mid region of the mainstream, with little pretence to attract back traditionalists or reach out to deeper non-country genres such as pop, hip hop, rock and r‘n’b. It shores up a core sound that has been a firm fixture within the genre for well over twenty years and does this particularly well. A strong entrenched country voice strides across the record presenting eleven tracks adhering to a high level of entertaining appeal. The record is awash with formulaic traits, but to what extent you judge formulas is down to personal perception and intent. Much of the content is not earth shatteringly new, even extended to the theme of the title of the main track, ‘Five More Minutes’, most famously replicated in the shape of the song Lorrie Morgan took to the top of the charts nearly thirty years ago. In familiar country tradition, McCreery’s cut takes you through all stages of life with the inevitable conclusion. A song that does have that earworm knack of attracting repeat plays when the mood permits. ‘Wherever You Are’ , ‘In Between’ and ‘This is It’ immediately jump out as tracks to keep the album’s wheels moving and a pitch to cement some acceptance in the customer sphere that it is aimed at. They add to a background soundtrack that has a southern flavour peeping out from the multitude layers of studio influence. There are moments when you want to halt proceedings, or perhaps give Scotty a few records to listen to, so that the talent filters down an alternative route. However, let us not ponder too much on what a record is not. Maybe the best approach to this record is to readjust the comparisons, tone down the intuitive analysis and accept the merits on face value. Armed with this agenda, SEASONS CHANGE comes across as a soundly constructed body of work, distinct in the model style of its aim and maybe makes an effort to stabilise a sound that has the potential to slip further away unless unchecked. 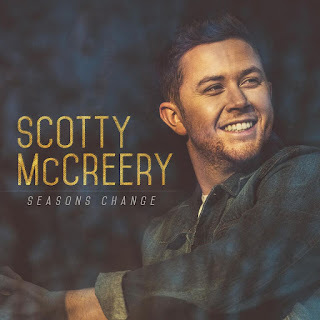 Scotty McCreery is currently undergoing his second country life, seemingly harsh on somebody not yet 25; such is the cutthroat nature of having to sell records to feed an entity.